When another player attacks Zhang Bao, he can attack that player. 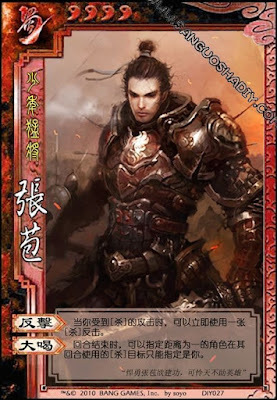 At the end of his turn, Zhang Bao can choose another player that is one distance from him. During the target's next turn, Zhang Bao is the only person they can target with an attack. It doesn't matter if Zhang Bao was hit or evaded the attack. He can use "Counterattack" in either case. Zhang Bao can only use "Shout" against a player that does not have a +1 next to him. Zhang Bao can in fact have a +1 himself. If this means that the other player is unable to reach Zhang Bao, then they cannot attack anyone. If Zhang Bao is killed after using "Shout", the effects are lost and the target can attack anyone.